If you've ever thought about streamlining and revitalizing your skin care routine, it's time to experience the healing, moisturizing properties of jojoba oil. This incredible product could replace your makeup remover, facial moisturizer, massage oil, and even shaving cream. Jojoba oil makes the perfect carrier for essential oils. It's a soothing massage oil, a common ingredient in the most high-end luxury bath and body products, and a popular home remedy for many skin problems. And now you can purchase it in its highest-quality organic form through Health Ranger Store. Buy the Purest Jojoba Oil! Yes, I want to try this amazing healing oil! Toss the can! Jojoba oil moisturizes skin and allows a razor to glide effortlessly, so you'll enjoy the closest shave possible without aerosols or costly shave creams. Try adding a few drops of your favorite soothing essential oils to help soothe inflammation and prevent razor burn! Just apply a few drops of jojoba oil to a cotton ball. The oil quickly and effectively removes makeup from your eyes, lips, and skin. It won't leave behind any oily buildup or residue. Jojoba oil adds shine, softens hair, moisturizes the scalp, detangles and helps prevent broken hairs and split ends, and even helps prevent or reverse hair loss! By rubbing a few drops between your hands and gently massaging into your scalp and through your hair, you'll disburse the oil evenly. You could even add a few drops to your regular hair conditioner if you're not ready to discard conditioner entirely. 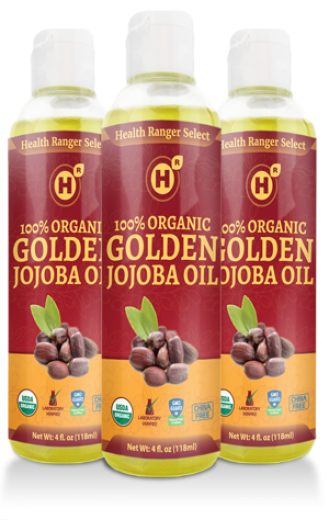 Health Ranger Select 100% Organic Golden Jojoba Oil always comes to you in its purest form: gently expeller-pressed, then bottled with absolutely no added ingredients here in the U.S.A. And like other Health Ranger products, it's been lab tested to verify that it's free from pesticides, heavy metals, and other contaminants, so you can be confident that you're using the best of the best on your skin. Invest in Pure Jojoba Oil!